In 1848, the widow Suzanne Loetz takes over the factory after her husband’s death, Johan Loetz. Hence the name of the glass factory: Loetz Witwe. In 1879 her grandson Max Ritter von Spaun takes the lead from her. 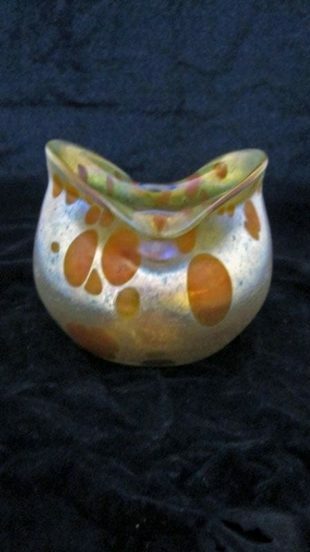 Von Spaun starts with developing the technique to make the glass iridescent, the main feature of this Bohemian glass factory. The new designs are exhibited for the first time in 1898 in Vienna. In 1900 Loetz/Von Spaun gets a Grand Prize for the original designs of the iridescent glass. 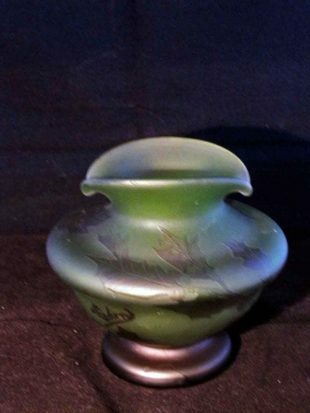 Tiffany also made at the end of the 19th century iridescent vases. This makes Von Spaun strongly influenced. However, neither Tiffany, nor Loetz have the iridescent technique invented. This technique was borrowed from the ceramic. It was in particular Clement Massier who successfully experimented with ‘iridescent’ glazes on ceramic. Loetz and Tiffany have applied it with a lot of creativity on the material glass. In the factory of Loetz other artists of that time – Kolo Moser, Dagobert Peche, Josef Hoffmann, Michael Powolny, Otto Prutscher, Maria Kirschner – were asked to create designs for the company by Loetz. A design by Kolo Moser is to see below. 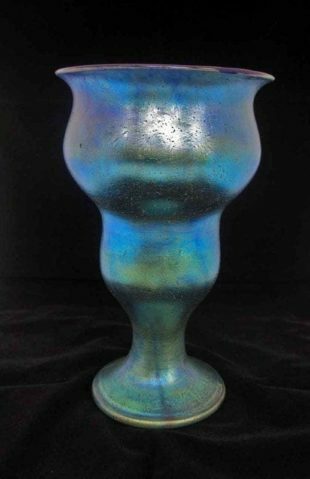 Most pieces of Loetz have no signature, just the vases that were intended for export to the USA, were signed. 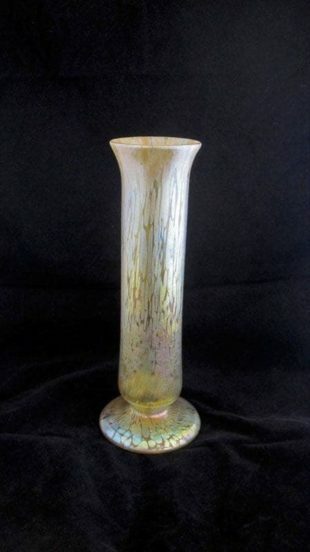 Lots of glass objects are determined for Loetz and also sold on eBay, while they are of other Bohemian factories, such as Kralik or Rindskopf. Loetz glass has a higher quality and is therefore also often more expensive. Recent literature, especially by the glass museum in Passau, has made the determination though a lot easier. If there is no model number known, then it is usually not a Loetz glass.